We teach Mysore style, which means you can come within the flexible starting time and start and end your practice individually. 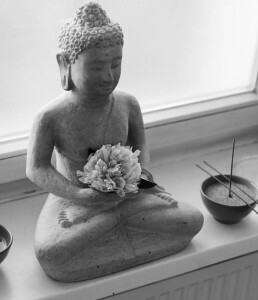 During the week you can come in the morning until 8:30 (the studio opens at 7am and the chant is at 7:15am), from 9:30am we as the teachers practice (the self practice is open to students of Ashtanga Studio) and in the evening you can come until 7:15pm (studio opens at 6pm, chant is at 6:30pm) and start your practice. All classes are open to beginners and advanced students. On Moon Days (Full and New Moon) there is no class in the morning. In the evening we teach a „Moonpractice“. To get to know this lovely practice we offer a Beginners-Spezial: for 80€/65€ you can come as often as you like for 4 weeks. Please be at the Studio 10 min before we start for your first visit so we can gove you a littel introduction. If possible email us before your first visit to the studio. Drop Ins only when you have Ashtanga Yoga knowledge. This individual form of practice allows the supportive attention on the student’s individual needs and possibilities. Mysore classes reflect the essence of the Ashtanga Yoga practice. Each student is practicing in his/her own rhythm, listening to the sound of the breath and the attention is turned inward. In this way yoga becomes a meditation through movement. If there are special issues or problems you can book a one to one teaching with Andrea.